I finally pulled out my bird blind for the first time this winter. It’s a great way to get shots of the birds in my backyard. My blind is basically a big camouflage tent. There’s room inside for me, the Beast, my tripod, even a chair. I zip myself in as Rich laughs, then I hang out in my backyard for a few hours. Last spring I got some great shots of my Painted Buntings with this technique. On this particular afternoon, it was rainy and gross out, but I had fun doing some backyard birding with my American Goldfinches, who were pretty active at the niger feeder. Niger is the preferred seed of these cheerful little birds. 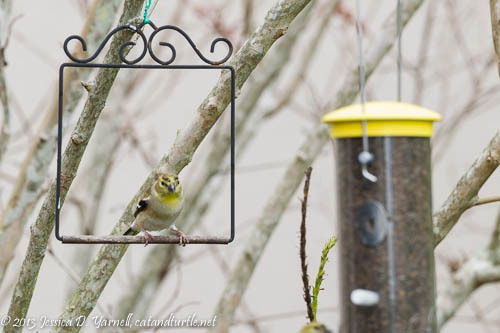 I place my feeder near a crape myrtle, and its bare winter branches make great perches for the goldfinches as they wait for turns at the feeder. 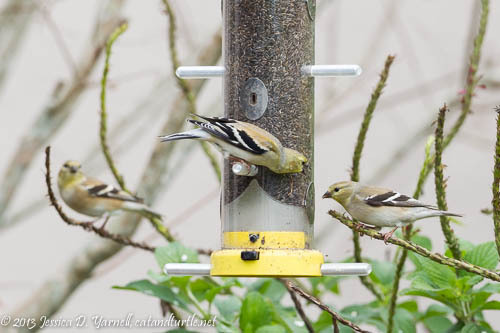 Every year Rich and I laugh at the “goldfinch conundrum” – how to fit 8 birds on an 8-port feeder. It doesn’t happen often! 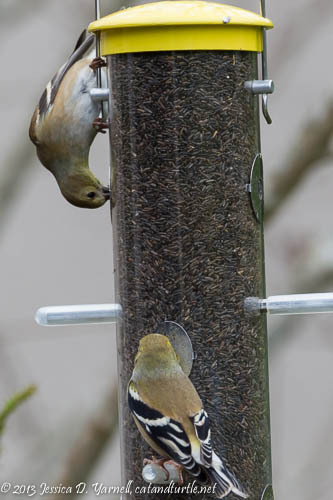 American Goldfinches are one of the few birds who will eat upside down. My feeder ports are positioned to allow birds to eat right side up or upside down, whichever they prefer. Most of my birds eat standing right side up. But this one bird seems to visit every morning, sit on the top of the feeder, and hang down to feed from the top port. He looks so silly! But he’s smart. I bet he knows that the freshest food is at the top of the feeder. My mom gave me a hummingbird swing a year or two ago. It hangs in my crape myrtle, where I fondly hope that a hummingbird finds it and uses it. I don’t see many hummers in my backyard, but you never know. The swing might be the perfect resting place for the hummers who visit while I’m at work! But I did chuckle when I saw the goldfinches using the swing as a perch as they waited for their turns at the feeder. The American Goldfinches weren’t the only active birds in my yard on this afternoon. 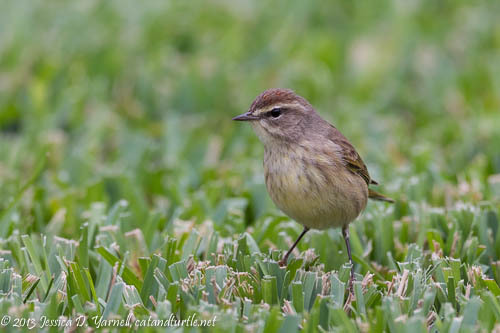 A curious Palm Warbler didn’t seem to mind the strange camo tent. He hopped closer and closer, letting me get some good shots of him as he jumped around on the grass. The only bad thing about the blind is that the ports are several feet above the ground. I’d love to add a port at ground level, which would have given me a gorgeous angle on this pretty little bird! Great shots of the little guys! You have some nice visitors. Where’s the shot of the blind?